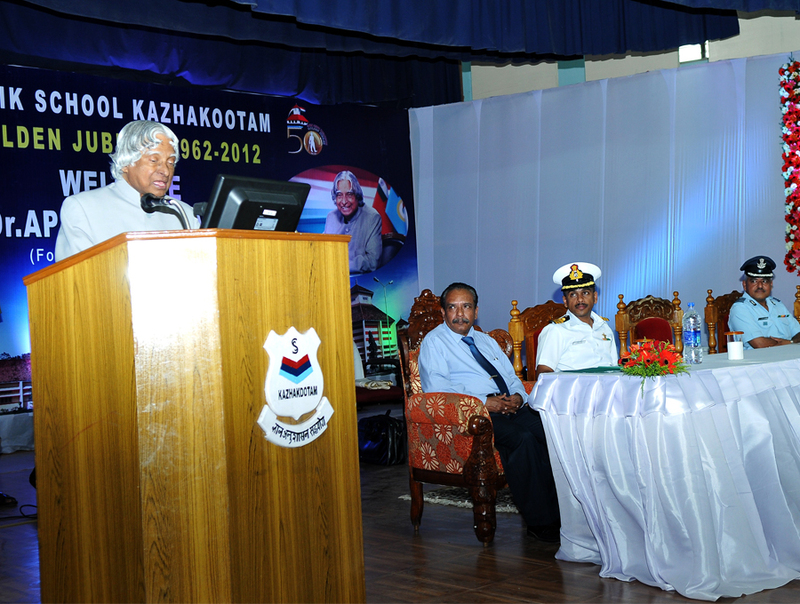 Dr APJ Abdul Kalam, a shining beacon of inspiration to the youth of this Nation and the former President of India visited Sainik School, Kazhakootam as a part of the Golden Jubilee Year celebrations of our school for a highly interactive session in sharing his thoughts with the young Cadets. The Missile Man of India never ceases to amaze any mind that comes in his presence, with his inspiring thoughts, eloquent wit and innate wisdom. The complete text of his inspiring speech at the VKK Auditorium. Address and interaction with the Students of Sainik School, Kazhakootam, Dec 16 2011. I am delighted to address and interact with the Students and teachers from the Sainik School Kazhakootam here in Thiruvanathapuram. My greetings to all of you. I am very happy to that this school, which was established 1962 will soon be completing its 50th orbit around the sun next year, and through all these years of flourishing it has given our defense services over 850 officers from among its alums. My congratulations to the pioneers of the schools, both from past and present. When I am here with all of you, I would like to share a few thoughts on “Evolution of Unique personalities“. Friends, it is said, “History has proven that those who dare to imagine the impossible are the ones who break all human limitations.” In every field of human endeavor, whether science, medicine, sports, the arts, or technology, the names of the people who imagine the impossible are engraved in our history. By breaking the limits of their imagination, they changed the world. Let us study certain unique events and unique creative leaders, who are always remembered. Dear friends, Look up, what do you see, the light, the electric bulbs. Immediately, our thoughts go to the inventor Thomas Alva Edison, for his unique contribution towards the invention of electric bulb and his electrical lighting system. When you hear the sound of an aeroplane going over your house, whom do you think of ? Wright Brothers proved that man could fly of course at heavy risk and cost. Whom does the telephone remind you of ? Of course, Alexander Graham Bell. When everybody considered a sea travel as an experience or a voyage, a unique person questioned during his sea travel from United Kingdom to India. He was pondering on why the horizon where the sky and sea meet looks blue? His research resulted in the phenomena of scattering of light. Of course, Sir CV Raman was awarded Nobel Prize. Do you know an Indian Mathematician who did not have formal higher education but had inexhaustible spirit and love for mathematics which took him to contribute to the treasure houses of mathematical research – some of which are still under serious study and engaging all-available world mathematician’s efforts to establish formal proofs. He was a unique Indian genius who could melt the heart of the most hardened and outstanding Cambridge mathematician Prof G H Hardy. In fact, it is not an exaggeration to say that it was Prof. Hardy who discovered a great mathematician for the world. This mathematician was of-course Srinivasa Ramanujan for whom every number was a divine manifestation. Friends, I have, so far, met 12 million youth in India and abroad, in a decade’s time. I learnt, “every youth wants to be unique, that is, YOU! But the world all around you, is doing its best, day and night, to make you just everybody else”. The challenge, my young friends, is that you have to fight the hardest battle, which any human being can ever imagine to fight; and never stop fighting until you arrive at your destined place, that is, a UNIQUE YOU! Friends what will be your tools to fight this battle. Criteria for achievement for unique youth. You were born with ideas and dreams. so don?t, you have wings. Learn to use them to fly. My message to you, young friends, is that education gives you wings to fly. Achievement comes out of fire in our sub-conscious mind that “I will win”. So everyone of you assembled here or whoever studies, will have “Wings of Fire“. The Wing of Fire will indeed lead to knowledge. Friends, knowledge makes you great. Now you know the importance of knowledge. When you leave your schools, a great friend is accompanying you. Who is that friend? That friend is – knowledge. Now, I am going to give you the knowledge equation. The next component of knowledge is Righteousness. Righteousness is described in a divine hymn. Where from you will acquire knowledge? Home, good books, teachers and teaching environment, coming into contact with good human beings, teaching websites in internet. When the schools teach the students to use the knowledge with creativity, righteousness and courage, nation will have large number of empowered and enlightened citizens, which is vital for the growth of the individual, growth of the family, growth of nation and promotion of peace in the world. Let me now present what I learnt from my teacher. Giving an aim at right age. When I think of my childhood days, I am reminded of Shri Sivasubramania Iyer who taught me when I was studying in 5th class at the age of 10. He was the great teacher in our school. All of us loved to attend his class and hear him. One day he was teaching about bird’s flight. He drew a diagram of a bird on the blackboard depicting the wings, tail and the body structure with the head. He explained how the birds create the lift and fly. He also explained to us how they change direction while flying. Nearly for 25 minutes he gave the lecture with various information such as lift, drag, how the birds fly in a formation of 10, 20 or 30. At the end of the class, he wanted to know whether we understood how the birds fly. I said I did not understand how the birds fly. When I said this, the teacher asked the other students whether they understood or not. Many students said that they also did not understand. Our response did not upset him, since he was a committed teacher. Our teacher said that he would take all of us to the seashore. That evening the whole class was at the sea shore of Rameswaram. We enjoyed the roaring sea waves knocking at the sandy hills in the pleasant evening. Birds were flying with sweet chirping voice. He showed the sea birds in formations of 10 to 20 numbers. We saw the marvelous formations of birds with a purpose and we were all amazed. He showed us the birds and asked us to see that when the birds fly, what they looked like. We saw the wings flapping. He asked us to look at the tail portion with the combination of flapping wings and twisting tail. We noticed closely and found that the birds in that condition flew in the direction they desired. Then he asked us a question, where the engine is and how it is powered. Bird is powered by its own life and the motivation of what it wants. All these things were explained to us within Fifteen minutes. We all understood the whole bird dynamics from this practical example. How nice it was? Our teacher was a great teacher; he could give us a theoretical lesson coupled with a live practical example available in nature. This is real teaching. I am sure many of the teachers of this school follow this example. For me, it was not merely an understanding of how a bird flies. The bird’s flight entered into me and created a special feeling. From that evening, I thought that my future study has to be with reference to flight and flight systems. I am saying this because my teacher’s teaching and the event that I witnessed decided my future career. Then one evening after the classes, I asked the teacher, “Sir, please tell me, how to progress further in learning all about flight.” He patiently explained to me that I should complete 8th class, and then go to high school, and then I should go to engineering college that may lead to education on flight. If I complete all my education with excellence, I might do something connected with flight sciences. This advice and the bird flying exercise given by my teacher, really gave me a goal and a mission for my life. When I went to college, I took Physics. When I went to engineering in Madras Institute of Technology, I took Aeronautical Engineering. Thus my life was transformed as a rocket engineer, aerospace engineer and technologist. That one incident of my teacher teaching the lesson, showing the visual live example proved to be a turning point in my life which eventually shaped my profession and flying my friends. My teacher Iyadurai Solomon, was an ideal guide for an eager young mind that was yet uncertain of the possibilities and alternatives that lay before it. He made his students feel very comfortable in 8th class with his warm and open-minded attitude. My teacher use to say that the teacher has to empower all categories of students excellent, good and average. During my stay at Ramanathapuram, Schwartz High School, my relationship with him grew beyond that of teacher and pupil. In his company, I learnt that one could exercise enormous influence over the events of one?s own life. Teacher Iyadurai Solomon used to say, “To succeed in life and achieve results, you must understand and master three mighty forces- desire, belief and expectation.” Iyadurai Solomon, who later became a Reverend, taught me that before anything I wanted could happen, I had to desire it intensely and work. One can be absolutely certain it would happen. I have seen him giving preference to many students who were not doing well in the class. They used to make up and subsequently perform better. This message, I am sure is applicable to all the teachers today. If all the teachers decide to create a desire in our Students to work towards and aim in life with value system they will definitely achieve their goal. Shining trait of my teacher’s teaching became his self-less service. From my discussions with many citizens from the country and across the world, I am convinced that education with value system is the need of the hour today. You can navigate the time. As you all know, the earth rotates on its own axis once in a day having 24 hours or 1440 minutes or 86400 seconds. Earth itself orbits around the sun. It takes nearly one year for an orbit. With the completion of one rotation of earth around the sun, your age is added by one year as you are living on planet earth. Seconds fly, minutes fly, hours fly, days fly and years fly. We have no control over it. The only thing that we can do is, while the time flies, we can navigate the time. “Let not thy winged day, spent in vain“. Young friends, all of you have to have a mission in life and work for it by navigating the time towards the mission. Dear friends, during the last few years, I have seen, how India Vision 2020 has inspired the people particularly the youth of the nation, which has resulted in many taking up many missions directed towards Vision 2020. Now I recall a situation in 1990 beginning when I was interacting with the youth of Ahmedabad, one girl asked me a question “When can I sing a song of India?” At that time, her brother who was United States was always talking about the best in the United States. This girl sitting in India was fed up about his brother’s stories and in her quest to find an answer she asked me “When can I sing a song of India?” How do I answer, I have explained about the Developed India Vision 2020 and told her that have a confidence and certainly you can sing a song of India by 2020. The same spirit echoed everywhere during that time. But for the last few years, while interacting with the youth, I had seen a marked change in the thinking of the youth. They have always been asking me “What can I give to the nation?” That means youth are ready to contribute for the national development? Recently during the last one year, I see a further a change, they tell me “I can do it“, “We can do it” and the “Nation will do it“. With the 540 million youth of the nation whom you represent, actively participating in the development process, I am sure that India will be transformed into a developed nation before the year 2020. My greetings and best wishes to all the students assembled here for success in their educational mission. May God bless you. I will always remember the importance of time. My motto will be “Let not my winged days, be spent in vain“. I will always work for clean planet Earth and clean energy. I am as young as my faith and as old as my doubt. Hence, I will light up then, the lamp of faith in my heart. My National Flag flies in my heart and I will bring glory to my nation.